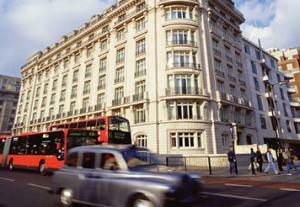 Once a stately apartment building overlooking Hyde Park and Marble Arch, the 5* London Marriott Hotel Park Lane is now a leading luxury hotel in London. A stroll from celebrated landmarks, famed theatres, grand department stores and the charming shops of Mayfair and Oxford Street, it exudes the intimate air of a boutique hotel, from the sleek lobby scented by exotic flowers, to elegant guest rooms appointed with luxurious new bedding, sumptuous bathrooms and high-speed Internet access. Dining here is an affair, with British cuisine prepared to excite the senses in 140 Park Lane Restaurant and Bar. Master the art of relaxation, with a stunning indoor pool and well-equipped fitness centre awaiting your arrival. The luxury 5* London Marriott Park Lane offers a refined conference and meeting facility, along with outstanding catering and technology services to please the most discerning client.